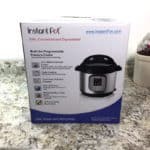 Love making mac and cheese in your Instant Pot but looking to try something different? These ten variations are for you! 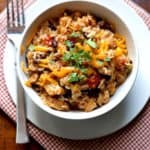 Make either my Classic Mac and Cheese or my 4 Ingredient Instant Pot Mac and Cheese. 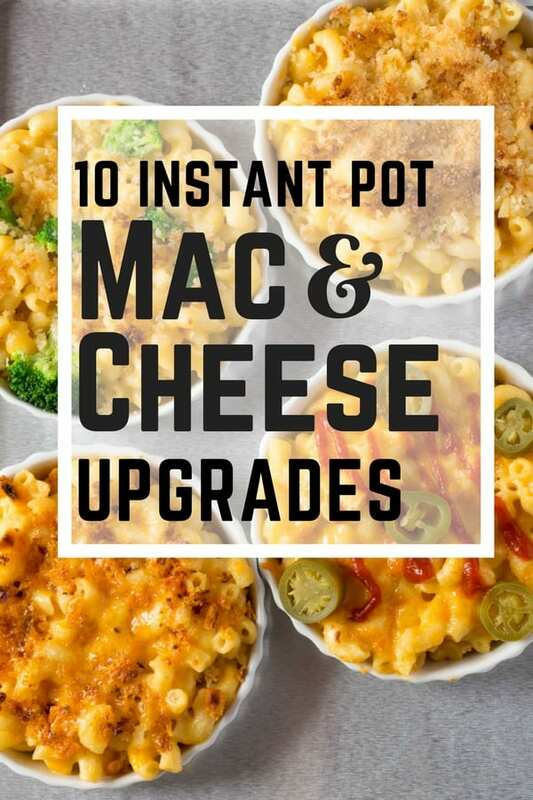 There’s something magical about the combination of broccoli and Cheddar. But why stop there? Peas, spinach, and kale also bring great flavor to mac and cheese. Stir in one (10-12 ounces) bag of thawed broccoli florets or about 3 cups of steamed fresh broccoli. Add a generous pinch of freshly ground black pepper. Stir in one (10 ounce) bag frozen peas. Unlike broccoli, don’t worry about thawing the peas first. The thaw quickly when combined with the hot mac and cheese. If desired, stir in 4 slices of crumbled, cooked bacon. Heat 2 teaspoons olive oil in a large skillet over medium high heat. Add 2 cloves of minced garlic in a large skillet. Cook until soft and fragrant, stirring constantly. Add 16 ounces spinach or kale. Cook until tender, about 3 minutes for spinach and 6 minutes for kale. Season with salt and pepper to taste. Place cooked greens on a plate lined with a paper towel to drain. Take a second paper towel and dress down on the greens to remove excess moisture. Stir greens into cooked mac and cheese. Love spice? These are for you! Melt 1 tablespoon butter in a medium skillet. Add 2 diced, seeded fresh jalapeños. Cook until tender. Add 2 chopped green onions (optional), white and green parts. Cook until soft. Stir peppers and onions into into mac and cheese. Stir in about 1/2 cup chopped pickled jalapeños. Top each bowl with additional pickled jalapeños slices. Combine evaporated milk with 2-3 chipotle peppers in adobo sauce (for a milder mac and cheese, use only one pepper) in a blender. Blend until smooth. Add milk as directed. In a large skillet, melt 1 tablespoon butter over medium high heat. Add 1 cup chopped kimchi. Cook until most of the liquid is reduced, about 5 minutes. Stir cooked kimchi into hot mac and cheese. 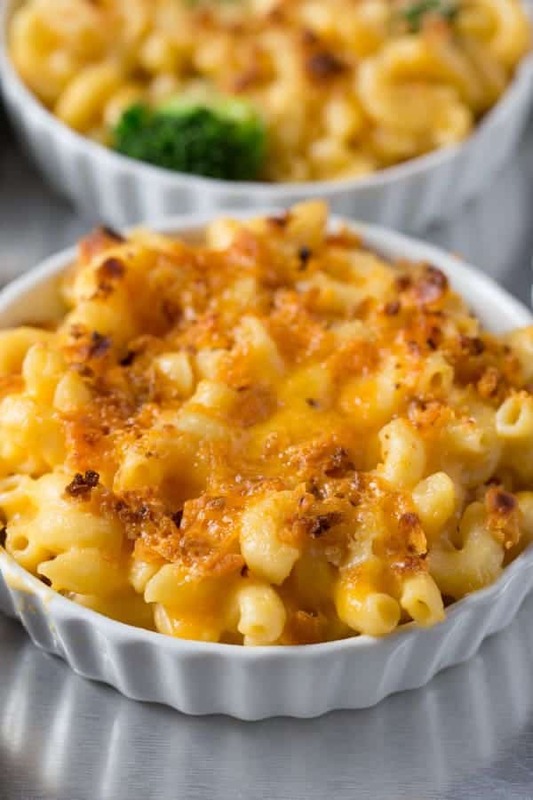 If you love mac and cheese with a crunch, try one of these options: a classic mac and cheese, with a thin layer of crunchy breadcrumbs or a super crunchy mac and cheese. 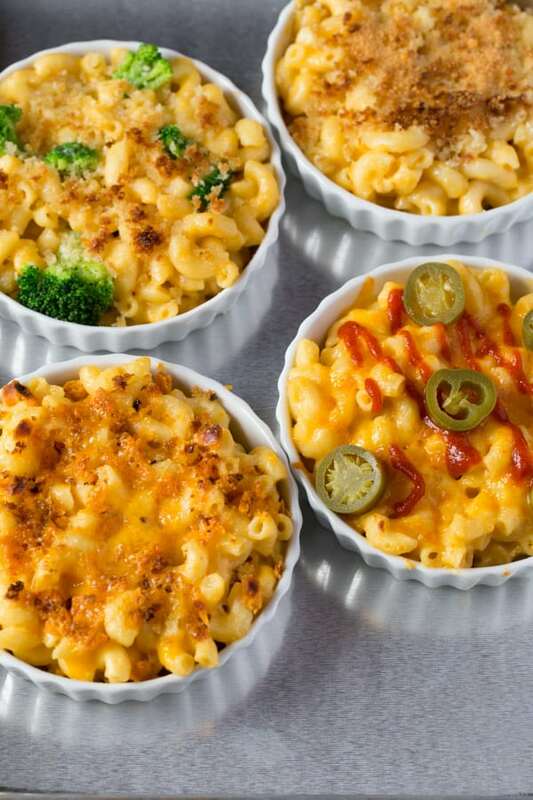 The super crunchy mac and cheese is spread in a thin layer on a baking sheet– it’s almost all crunchy perfection. Preheat oven to 350 degrees F. In a small bowl combine 3/4 cup bread crumbs and 4 tablespoons melted butter. Place mac and cheese into a buttered 9×13-inch baking dish. Top with crumb mixture. Bake until topping turns golden brown and edges of the mac and cheese are brown, about 30 minutes. Preheat oven to 450 degrees F. Combine 1 1/4 cups panko breadcrumbs and 6 tablespoons melted butter. Butter a rimmed (18×12 inch) baking sheet. Spread mac and cheese evenly over the baking sheet. Top with crumb mixture. Bake until the cheese bubbles and the topping turns brown, about 20 to 25 minutes. Pulled pork? Fried mac and cheese? These two variations are over-the-top– a small helping goes a long way. Think of these as party foods, not a main dish that you’d serve on a weeknight. Preheat oven to 350 degrees F. Heat 16 ounces (about 2 cups) cooked pulled pork until thoroughly warm. 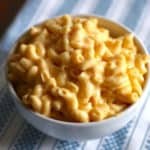 Spread mac and cheese into a buttered 9×13 inch baking dish. Top evenly with pulled pork. Sprinkle 1 cup grated Cheddar evenly over the pulled pork. 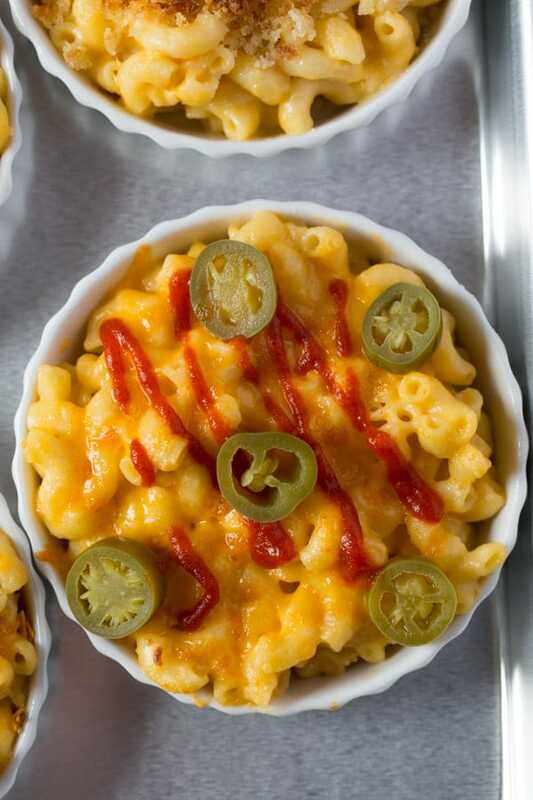 Bake until cheese melts and the mac and cheese bubbles, about 20 minutes. Chill 3 cups mac and cheese until firm. In a shallow bowl, whisk together 2 large eggs and 2 tablespoons milk. Place 1 1/2 cups dried breadcrumbs on a large plate. Scoop macaroni and cheese into 1-to-1 1/2-inch balls. You should get about 12. Roll mac and cheese balls first in egg mixture and then in breadcrumbs. Place coated balls on a parchment-lined baking sheet. Chill mac and cheese balls while you heat the oil.